Dr Mary Boyle is one of the co-founders of Teaching the Codex, and a Visiting Scholar at the Großbritannien-Zentrum at the Humboldt University in Berlin. 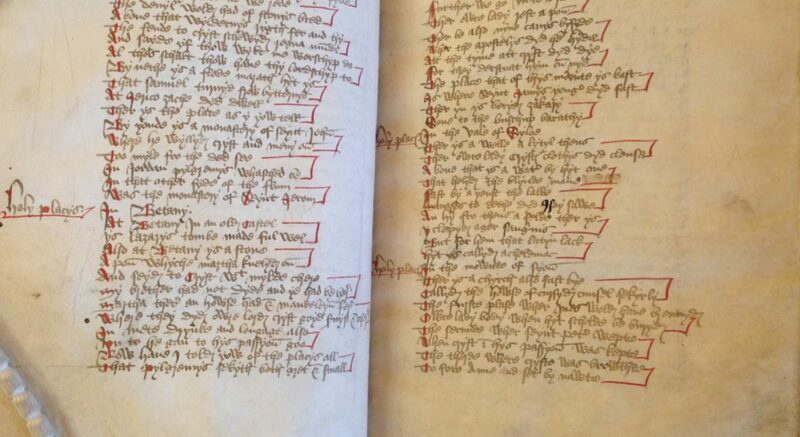 Here we reblog her post on her summer project looking at marginalia in surviving copies of Sebastian Brant’s ‘Narrenschiff’. I’m lucky enough to have been spending this summer as a visiting scholar at the Großbritannien-Zentrum (Centre for British Studies), which is part of Berlin’s Humboldt University. Two months of this period was funded by the DAAD (Deutscher Akademischer Austauschdienst/ German Academic Exchange Service) as part of a project looking at reader responses to Sebastian Brant’s Narrenschiff (Ship of Fools), which was first published in 1494. Continue reading "Paleography and Music Notation: Using Research Methods to Develop Pedagogy"
Continue reading "Reading a Manuscript Description (Joint Blog Post/ Teachable Features 3)"
Continue reading "Teachable Features 2: Pricking and Ruling, MS. e Musaeo 54"
Continue reading "Teachable Features 1: Binding Error, MS. Bodl. 565"